The volunteer mural project is now over. 7 straight days, 43(ish) hours (plus 10 or so for design sketches and revisions), of working on the 22’ x 10’ wall was both physically and mentally challenging. I was completely absorbed by this project and time became more abstract than normal. By 6:15PM on 2/15/19 (the last day), part of me knew I needed to do more – maybe one more bubble or bright piece of coral. It’s such an interesting experience creating a giant piece of art that I can’t just casually keep working on at my own pace. There was a timeline, a goal to have it complete, so the space could be used again for the families who frequent the waiting room. It was art that wasn’t created for me, but for other people to enjoy and to interact with. It was great to see and hear reactions from the staff at the clinic; I received very encouraging and kind words daily. I truly feel like I made a difference in this community. I wish I could be a fly on the wall to see and hear the clients/patients’ reactions to it. My hopes are that it enhances their experience while at the clinic, yet, I’ll never truly be able to measure any sort of impact. I guess that is the nature with public art. The overall goal of this mural was to promote literacy and brighten up a space in a local health clinic. I first found out about it through a professor and advisor at San José State. Fortunately, I had the time and energy to contact the coordinator and commit to taking on this endeavor. This particular clinic off Bascom Ave. in San José serves low-income families and partners with a bilingual team from Stanford to promote literacy and school readiness. A study is being conducted with some patients in which participants are receiving interactive texting strategies they can use to help their young children learn to read. Stanford has initiated a few other mural project interventions at “safety net” clinics in which they revitalize the waiting rooms to bring a message of hope rather than despair. The vulnerable population that typically utilizes these types of local Silicon Valley clinics are often struggling with poverty and other disadvantages. Bright, colorful, inspiring murals bring a minute change that is needed in the usually sterile, white wall spaces. They promote interaction between children and their parents and encourage speaking, reading, and counting, among other things. Unfortunately, many low-income health clinics’ walls and floors are often barren. Through this artistic and community-driven effort, these places can transform into a safe, inclusive, and educational space, healthy for families and the health workers who serve them daily. I’m already enjoying these new beginnings of 2019. I finished my teaching credential (preliminary) at the end of December, and officially filed my paperwork at SJSU this week! (Yay!) Now I’m starting to look for art teaching jobs around California – San José greater area, Sacramento…maybe even LA. While finishing my Master’s degree, I will continue to substitute teach around San José and helping out at Drawn 2 Art’s studio in Los Altos. I’m “shopping” around at this moment (within the public & charter school systems) and getting a sense for how different schools function. I’m both excited and nervous about the new opportunities coming my way; however, I am most grateful for the experiences I’ve had so far in my student teaching and relationships I’ve made through SJSU’s teaching credential program. My student teaching experience last semester was particularly amazing, and I’m a little sad I can’t finish the semester with those students. This painting was made for my sister, Jenn; she wanted something for her office wall. Acrylic on loose canvas – about 46″ x 22″. Ode to the hills of California…. These cat portraits are for my boyfriend’s sister, Hanna; they are basically her children. I was going for that retro 70s/80s portrait feel with two angles of the cats. Conté crayon on black paper, 8.5″ x 11″. Works/San José Gallery had an open call for artists to enter portraits in the form of a square. I had 4 mini canvases (4″ x 4″) and used them to create an autobiographical portrait of me and Christian to celebrate our love, squared. This painting was particularly challenging, but I think I more or less captured our gazes and expressions. It will be on display in the SJ downtown gallery from Jan. 25 – mid-February. Life has been full – ups and downs – but feeling strong and focused as of late. While wrapping up my first phase of student teaching high school art, and working towards a masters in art education, I’ve been pursuing my own creative interests. I’m participating in Silicon Valley Open Studios during the first 2 weekends of May and will be selling some of my paintings, pottery, and prints at the art studio I substitute teach at – Drawn2Art in Los Altos. Also, during the month of May, one of my latest paintings will be part of Social Policy‘s art show “Chosen Family” in downtown San José. That spot has some great coffee/tea and food if you’re in the area. Opening reception is May 4th, 7PM-10PM. Relocating to San José was challenging at first because of the drastic change in lifestyle I had to make from living abroad in the Netherlands and elsewhere in California before that. I felt like I couldn’t connect and did not plan on staying for more than one year. However, things change – I changed. The resistance to putting down roots was softened after I found love and a community. After almost 4 years of living in the area, I can genuinely say I’ve made this place my home – My San Joasis. This painting is a vibrant portrayal of my backyard view. I think it captures the essence of how I’ve made a little oasis with my partner and exhibits the gratitude I have for our space and the family we created. It’s part of a series of acrylic landscape paintings I call LandEscapes. Ultimately, these works of art were created to remember a connection I had with the earth and to escape into the beauty that I know won’t be around forever. I recreated my Weeping Land piece and donated it to local nonprofit gallery Works/San José‘s for their annual auction fundraiser. The last day to bid is this Saturday, Dec. 2 by 6PM. If you’re in the area, please check it out – there are so many great artists who have something showing in the gallery. Being a curious individual, I often ask myself questions about the intricate designs of the world, observing and appreciating the detailed environment around me. In the past four years, I have been turning these explorations into my own creative interpretations. The acrylic painting series I’ve been developing lately is called “LandEscapes”; in it I focus on natural landforms, utilizing bright colors, contrasting values, and line. Through these paintings, I hope to bring to light environmental elements that are around us, allowing space for viewers to feel a familiar connection to the earth. The flagship of the LandEscape series was the inspiration for this artwork you see today – a new reincarnation of the original piece “Weeping Land”. I wanted to express how nature is greatly affected by human development and exploitation. As I was creating this, people everywhere were feeling the results of some awful natural disasters: hurricanes, earthquakes, and wildfires. I weep for them, I weep with them. But I also challenge us all to face the realities of climate change and to get involved to make a needed difference in our communities. 80% of proceeds from this piece will go to support the great things Works/San José is doing; 20% will be sent to help with California wildfire relief to the Community Foundation of Sonoma County. I’ve been working through some personal things in the past month of this new year and as January comes to an end, I’m feeling better and trying my best to get rid of things and thoughts that don’t serve me. Daily I’ve been setting aside time to: pay attention and be fully aware of my body (through yoga & meditation); shut off the mind from tangential wandering; breathe intentionally and focus on mindfulness. There is no need to worry about the future and the uncertainty it brings, instead enjoy the now and hold on to the gratitude and wholesome thoughts. Patience, remember, for this too shall pass. Trying to remain above the cynicism. This artwork represents how I’m trying to see the world. My world, and all of yours. A place full of balance, freedom, peace and justice. It’s hard to imagine it though, and even harder to believe in it. I realize it’s just a dream, but perhaps a dream we all have in common? I can only hope. Deep down I have to trust that all of humanity is rooted in the same desire to live in harmony with one another. We are all just a bunch of living, breathing organisms sharing the same resources and creating systems to “deal” with our surroundings. My hope one day is that we collectively can find a way to live respectfully and peacefully with each other AND with our own planet – to stop exploiting and abusing each other and our natural resources. It’s more than tolerance, more than acceptance, but real support, understanding, and unity. We have so much more in common than we realize…but I know it’s hard at the moment. As for now, I can only keep the hope alive through art and music and kindness. Perhaps Curtis Mayfield’s song “Move On Up” is the best thing for everyone to listen to right now. Such a gem 🙂 We’ll Move On Up…Enjoy! LandEscapes 6 – you rock, rock. Stay Tuned for more as the journey continues. Also, I became a member of a gallery in San José to explore the local art scene. It’s called Works/San José and they happened to be having a member exhibition called Vote Your Subconscious. I entered a small piece from an earlier LandEscapes blog entry. It will be on display until Sept. 11 and is tucked away, right next to a lively painting of the Donald. Contrasting beauties I guess…I’m grateful to have my escapism from this crazy world sometimes. Well, the reasons varied, but I initially went due to my sense of adventure and wonder. I wanted to learn more and gain skills to become an educator; I wanted to get away, to rejuvenate and reflect on how beautiful life is. I also wanted to connect deeper to this place I call home. I ended up meeting some of the most genuine, interesting, experienced, curious, kind, and amazing group of people – including my cohort of 15 + the teachers and leaders of the course. They all collectively made this experience a worth while professional (and personal) development week off. During that week, we were trained on how to share knowledge and interpret science on an empathetic level in order to inspire the blooming of more environmental stewards. We were given tools to essentially pull apart and deconstruct ecosystems, in order to build them back up again with our words and stories for better understanding. I like to think of it as a training on connecting people to place. Naturalists also observe nature by drawing or photographing and journaling about their observations. I doubt my nature journals will lead to breakthrough discoveries and they might not be published like the great John Muir, but it’s a useful tool to really pay attention to a place. We had a terrific professor of hydrology lead us through the entire course with brilliant guest speakers occasionally dropping by in our outdoor classroom. Some classes occurred while on nature walks, including geology, botany, and the search for beaver dams along the creek. We visited other places two of the days, including UC Davis’ research center (TERC) at Sierra Nevada College and learned about the natural history of Lake Tahoe. We also learned a great deal about the research that’s going on around the lake and around Sagehen’s experimental forest. I recommend picking up the California Naturalist Handbook. It provides great overviews on geography and biology of CA, and highlights some challenges we are facing now with global warming. We were also introduced to a cool app called iNaturalist. It’s a community for nature observations and has some great information on it. I also recommend checking this out if you take a lot of pictures of nature and are sometimes curious about what something’s name. I still have some observations to post for Sagehen Creek station, but my username is “renae” if you want to find me on it. It was sad seeing the week end. It’s truly incredible how quickly I connected with a group of strangers from different walks of life. I’m very grateful I met everyone I did and learned all of the information that I could grasp in such a short amount of time. I was very inspired by my classmates’ passion for the environment. On the last day, we all presented what we will be doing for capstone projects upon the completion of the course. All 14 projects I heard about were quite impressive and I know these individuals will make positive differences in their communities. I hope to carry my own project out within the next few months and to begin volunteering with some local parks. Although I slightly dreaded driving back to San Jose and returning to work, this week gave me the creative and inspiring boost I needed. Thanks to all of my fellow naturalists and our fearless leader for making these memories! I’m almost done with this next painting in my series. It’s based off a striking rock I met while hiking in Utah about 5 years ago. If you look closely the rock that looks like a face also is comprised of figures. There are some final touches that still need to be done, but I thought I’d share my newest creation. Next up, I’m moving on from my red rock pallet and will transition into some more aquatic and forested landscapes. Stay tuned! There has been a delay in this series, but it will continue soon, hopefully next week if time allows. I’ve been busy working on a few portrait drawings for a good friend, some sweet graphics for work and a few designs for a friend’s wedding this weekend (I’ll be updating my portfolio in the next few days, so stay tuned). 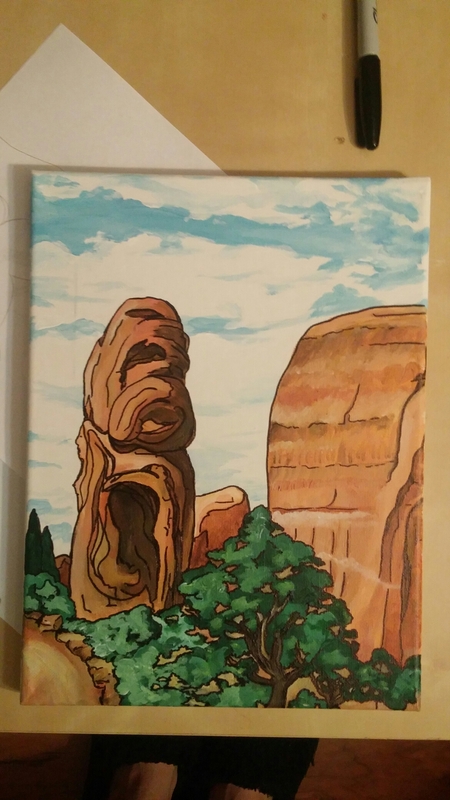 I have a few sketches worked out for the next two paintings; they’ll be smaller then these last two featuring the red rocks of Utah, but hopefully just as intriguing. In March I designed a t-shirt for the non-profit organization I work for; here’s the sketch I based it off of. The leaf at the top is part of the logo and is shown asymmetrically in the final design to give those astute viewers something to find.